…WE MEAN IT THIS TIME! 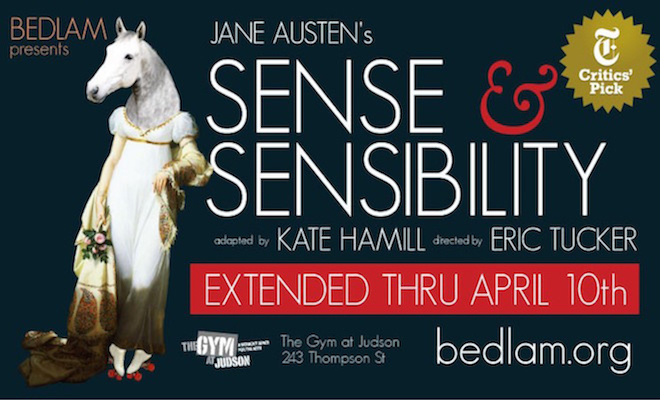 (New York, NY) – BEDLAM is pleased to announce the sold-out, award-winning and critically acclaimed production of SENSE & SENSIBILITY has extended for the final time at THE GYM AT JUDSON (243 Thompson Street), playing an additional 7 weeks through Sunday, November 20, 2016. Production b-roll footage and new production photos, available here. The Time Out New York Critic’s Pick which has now played more than 150 performances Off-Broadway is directed by Eric Tucker and adapted for the stage by Kate Hamill, SENSE & SENSIBILITY has scenic design by John McDermott, lighting design by Les Dickert, costume design by Angela Huff and choreography by Alexandra Beller. SENSE & SENSIBILITY won the 2016 Off-Broadway Alliance Award for “Best Unique Theater Experience,” and the cast features Laura Baranik, Kelley Curran, Jessica Frey, Jack Haley, Kate Hamill, Carman Lacivita, Nicole Lewis, Jason O’Connell, Flor De Liz Perez, Violeta Picayo, Benjamin Russell, John Russell, Samantha Steinmetz and Stephan Wolfert. You’ve never seen Austen like this! 2016 OBIE Award-winning BEDLAM’s rollicking adaptation follows the adventures (and misadventures) of the Dashwood sisters – sensible Elinor and hypersensitive Marianne – after their sudden loss of fortune. Bursting with humor, emotion, and bold theatricality, SENSE & SENSIBILITY asks: when reputation is everything, how do you follow your heart? The playing schedule for SENSE & SENSIBILITY is as follows: Tuesday through Thursday at 7:30pm, Friday and Saturday at 8pm, Sunday at 7pm, Wednesday and Saturday at 2pm, and Sunday at 2:30pm. Please note there will be no performances: Wednesday, August 17 at 2pm; Saturday, August 27; Wednesday, August 31 at 2pm; Wednesday, September 7 at 2pm; Wednesday, September 14 at 2pm; Sunday, September 25; and Sunday, October, 2 at 7:30pm. BEDLAM’s past critically acclaimed productions are enjoying runs across the country. Houston’s Stark Naked Theatre presented the award winning BEDLAM production of SAINT JOAN, directed by Eric Tucker from June 3 through June 18, 2016. BEDLAM returned to Boston’s Central Square Theater following last season’s SAINT JOAN, with director Eric Tucker’s TWELFTH NIGHT and What You Will, one play, two completely different ways, with the same five actors from the original New York production, which ran from June 9 through July 10, 2016. The McCarter Theater Center in Princeton, NJ has announced they will be presenting BEDLAM’s HAMLET and SAINT JOAN in repertory from January 13, 2017 through February 12, 2017.